Excellent balance between the sweetness of the beetroot and the tanginess of the celery. Perfect too as a sandwich filling. 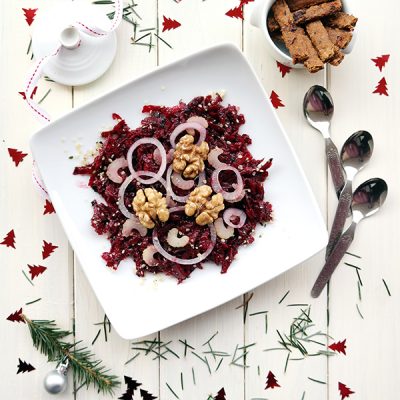 Grate the beetroots, thinly slice the stalk of celery and the onion and coarsely chop the walnuts. Combine all the ingredients and season with salt, pepper, finely-chopped parsley and oil. Sprinkle with hemp seeds and serve with Black Olive & Sundried Tomatoes Breadsticks.